As the title suggests here is the place to post any useful information regarding integration of Vera Home Automation with DemoPad. This first post will be updated with links to guides within this thread. I have been playing a lot and have quite a lot working now, so will fill these in very shortly, plus i have more to add to the pot. But feel free to add more. 1. Connect the WAN port on your VERA to a spare LAN port on your router. This will put VERA on your home network and assign it an IP address. 2. The MAC address of your VERA unit should be on a sticker on the underside the unit. Note this down. 3. Go to your routers Web page and log in, then navigate to your DHCP section and open a list of connected devices or DHCP Client List. This should show you a list of all devices on the network. It should have a Device Name(sometimes this is "unknown") a MAC Address and an IP address in the list. Find the MAC address of your VERA unit and note down the IP Address. 4. Then go to the section where you can make your VERA a permanent address, therefore if there is a power cut, etc when your router boots up it will ensure that your VERA always keeps the same address. 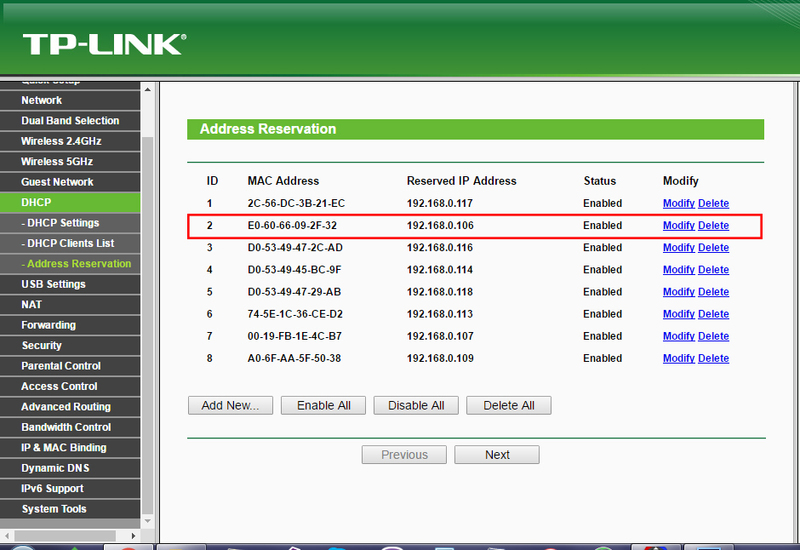 On the TP link it is the "Address Reservation" Tab is directly under the DHCP Client List so click on that. Then click add new and enter the information requested, which is generally MAC address and the IP address you want to assign the VERA unit. Hit save and you will be prompted to reboot the Router before changes take effect. So that's that for the router side. Setting up the Vera as a new device in DemoPad is easy. 5. 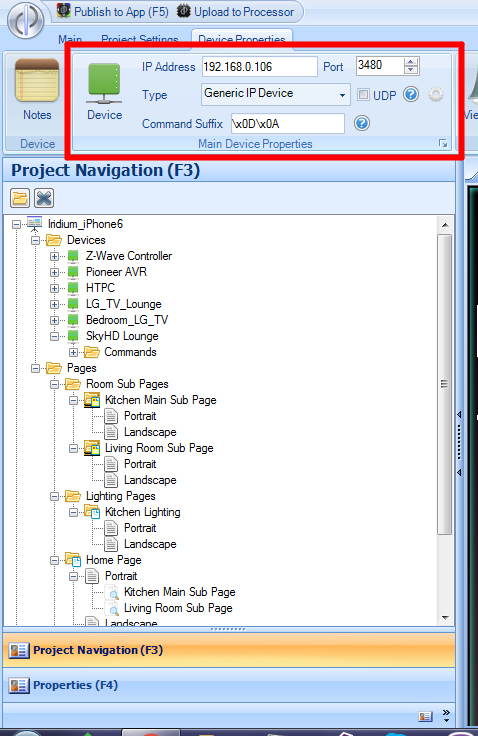 Select the Devices Folder and Click on New Device. Once "New Device 01" appears in the drop down. Click on the Name and rename it to something appropriate. 6. Enter the IP address you have assigned on the Router and enter 3480 as the Port Number. Last edited by Cheesegeezer on Thu Feb 09, 2017 1:38 pm, edited 7 times in total. To add a command we need the following info. 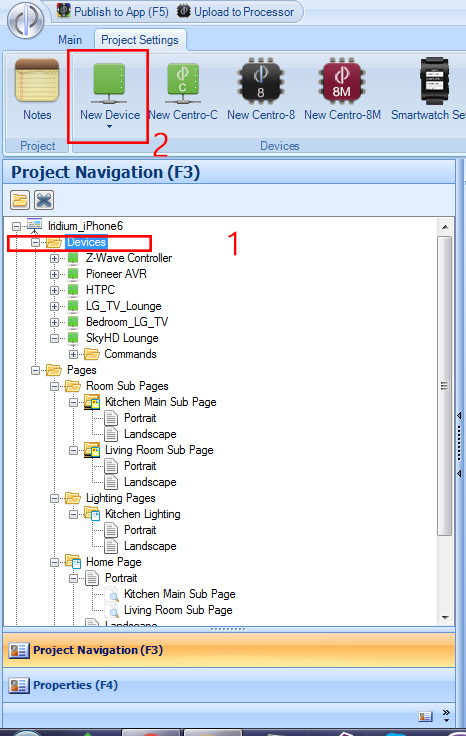 Information needed: IP address of VERA Controller. VERA Device Id of the Binary switch. 1. To find out the Device Id simply go to a web browser and type in the IP address of your VERA Controller, Log in if necessary. 5. 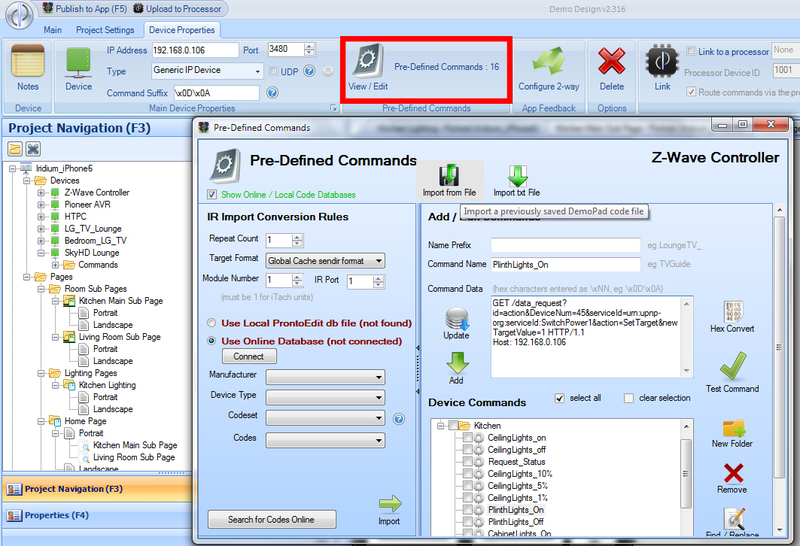 Select your vera controller in the Device list in DemoPad and the click the View/Edit button in the Pre-defined Commands. A new window will open. 6. 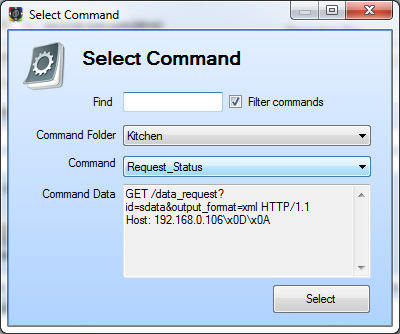 Give your Command an Appropriate name and add in the following in the Command Data Window. Where you need to enter the device id and your VERA ip address. If you wish to switch the light on set the 1 colored in red to 1 or to switch off set the 1 in red to 0(zero). 7. 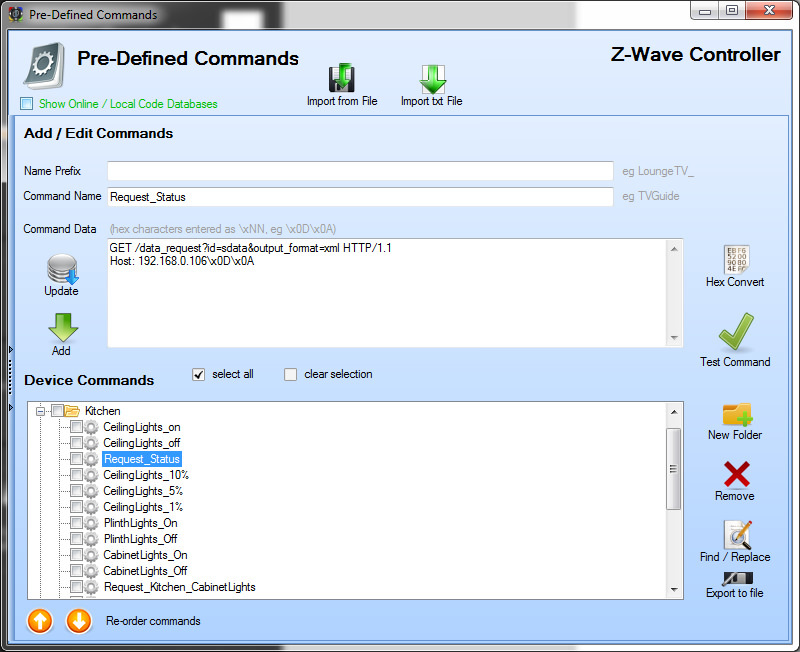 Once you have filled in the Command Data Window correctly, Click the ADD button to the left, click on the Command and click the Test button. Your device should switch on or off depending on what the binary command was set to. Last edited by Cheesegeezer on Thu Feb 09, 2017 2:04 pm, edited 3 times in total. This will set dim level to 10%, where device number is your dimming unit as found in Vera Device settings. The newLoadlevelTarget is the dimming value. between 0 and 100. Last edited by Cheesegeezer on Wed Nov 21, 2018 12:47 pm, edited 3 times in total. First you will need to create a scene in your Vera controller. If you are unsure how to do this follow the link below. Once you have done this you will have created a scene id number (highlighted in picture below). This is what you will need to let demopad know how to run a vera scene. Last edited by Cheesegeezer on Wed Nov 21, 2018 12:47 pm, edited 1 time in total. First off you need to know a few things from Vera. 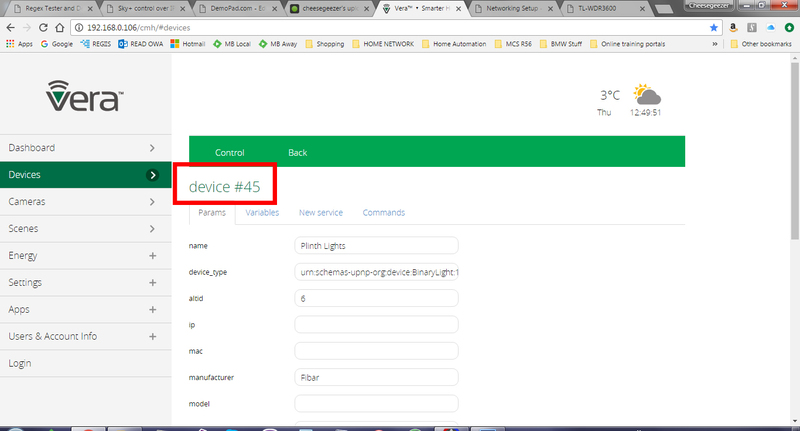 You need to know your device names as labelled in the Vera dashboard and more importantly what variables are returned after requesting the status of your devices. You will also need your ip and port for your vera controller. 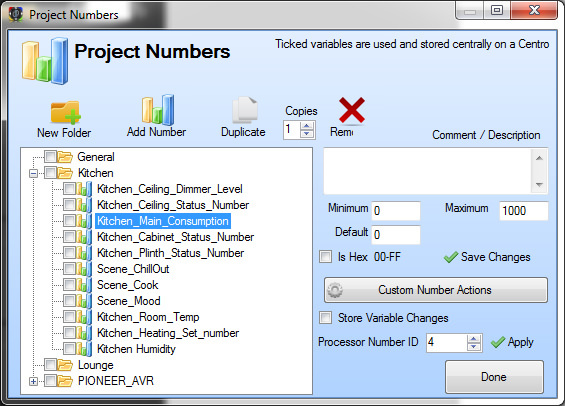 You will also need to set up in DemoPad some Numbers and Labels, or flags if you so wish. I am currently just using Labels and Numbers. We will go thru a few scenarios with vera. 5. getting the humidity of a room. Lets set up the numbers first. These numbers are what will be populated on the status request sent by demopad to the vera controller. 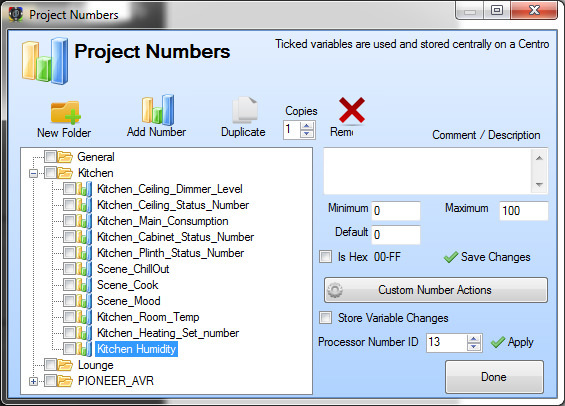 In demopad go to Project menu and click on numbers. Create a folder for a room. i.e Kitchen and then add the numbers for devices you have. Pay attention to the minimum and maximum values. These can be used for guages also. In the images below you will get the idea of what values to put in here. For example. Dimming and Humidity will be from 0% to 100%. Status is either on or off, so binary is used. 0 for off and 1 for on. for temperature, think realistically. I have a gauge set from 10 to 30 degrees. so my min and max numbers are 10 and 30, with a default of 18 (default value is the value given if no information is returned when the request is sent). And finally Power consumption - i have 10 leds in the ceiling of my kitchen and never go above 36Watts. However if you are using halogen or incandescent bulbs, then the power consumption will be much higher. A value of 0 and 1000 would probably be sufficient. However it's important to note that these min and max values only relate to gauges and not labels. Ok good!!! so now we need to interogate Vera to find out exactly what status' are returned. You need to be connected to the same network, thru LAN or WiFi. Once downloaded open Hercules. Allow access thru windows firewall if prompted. Then click on the TCP client Tab. Enter the IP address and port of your Vera Controller. Click on the Ping button under the IP address and you should get a green reply saying "REPLY". If you get a red ping timeout, check your IP and Port numbers are correct. Its important to note that Hercules requires different carriage return than Demopad. You should get a return like this. We are only interested in the devices here. So lets take the Ceiling lights and break it down. In that one line, we get all the information we need for the Kitchen Ceiling Lights. We get the Device Name, the status, the dimming level and the power consumption. watts is the current power consumption, and can be any value. So in DemoPad we just set up a Regex expression to pick out the information we need. 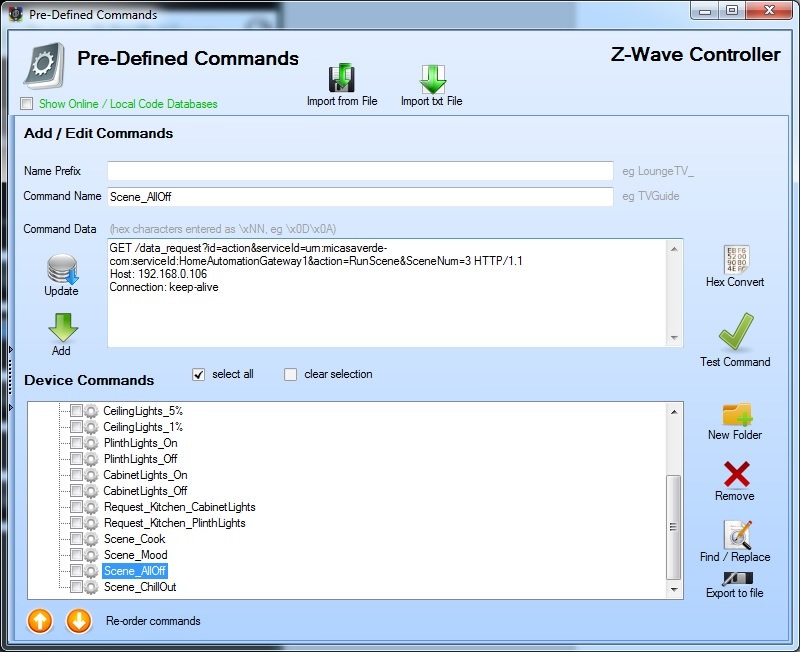 Click on the Zwave controller and then click on "Configure 2-Way "
In the image below you can see a lot of feedback is required to get specific information. 1. Give the feedback a unique name. 3. Ensure that "send captured data" is sent to a number and select the number you entered before for the desired state. 4. Enter the regex pattern. We need the Device Name and the item you want returned. For example ask the Controller if the ceiling lights are on. In the Data Input box we will specify the device name and ask it to return a 1 for the status. Note: everything is case sensitive, so pay attention to Upper and lower case!! 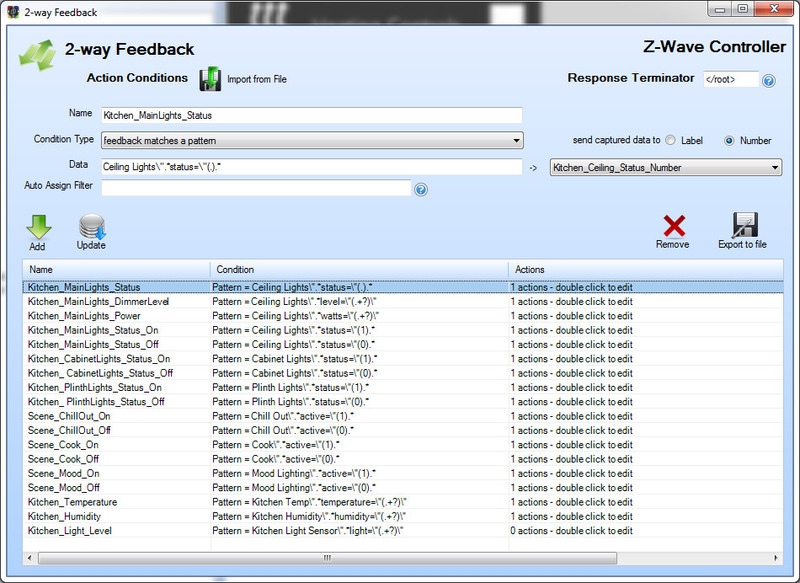 like this for ceiling dimming level and send captured data to "Ceiling dimming level" Number we created earlier. For Scenes you just need to look for the Scene name and if it's active or not. If you wish to set a flag to show a scene is selected or not. 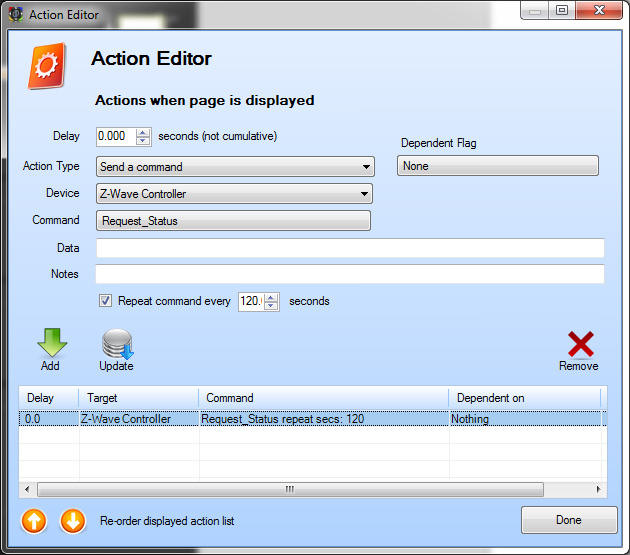 Double click on the the desired action condition. 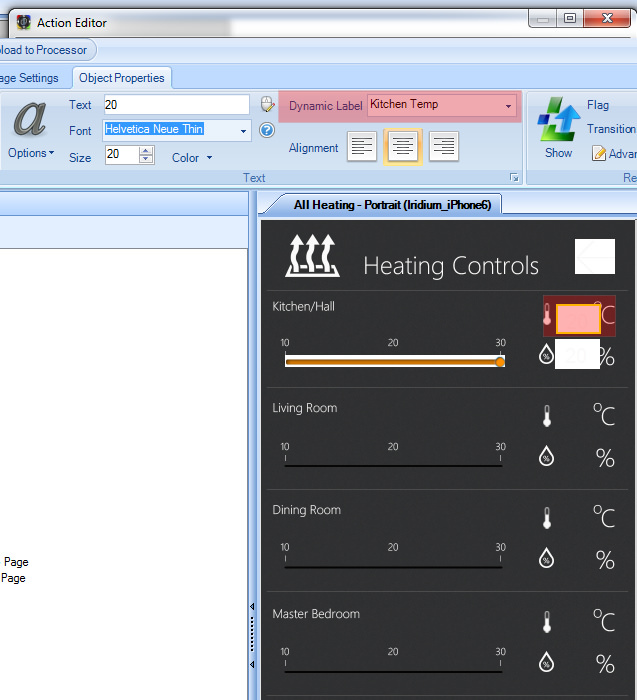 This is for Kitchen Room Temp. Select the label you created. 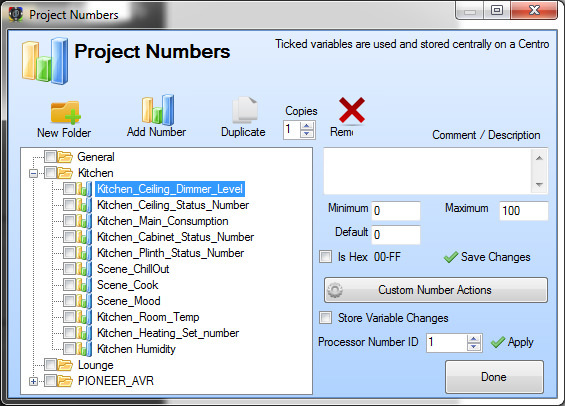 then from the drop down menu in Data, select the Number for the captured data under Number Variables. 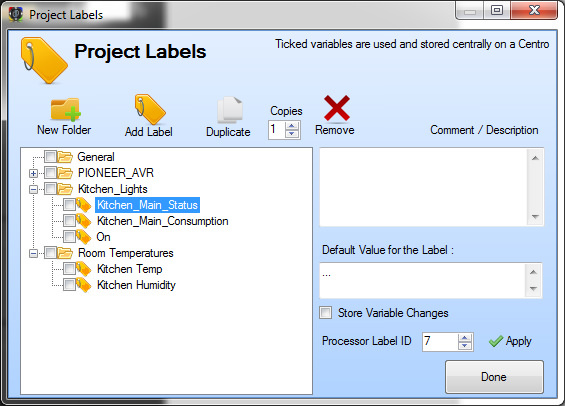 Now that is set up all we need to do now is add a label to our UI and set a dynamic label with the label we just set. And finally we need to send the request for all pages that use the information. Add this code into the data section, but change the IP address to match your controller like we did in hercules. Under the Page Settings tab, click "Edit" and select "Edit page Load Actions"
We need to "send a command"
and the command we need to send is the "Request Status" command. 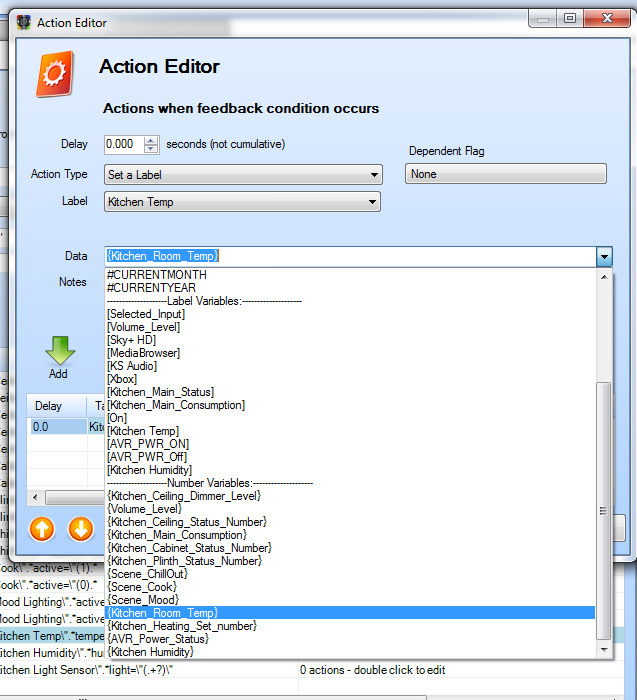 which you need to select from the dropdown in "Select Command"
for lights i would repeat every 3 to 5 seconds, you can do 1 if you want. That should be you all sorted. Good Luck!!!! Last edited by Cheesegeezer on Thu Dec 06, 2018 12:01 pm, edited 3 times in total. Is it possible to set a dim level ? This is what i have to set dim levels, where device number is your dimming unit as found in Vera Device settings. The newLoadlevelTarget is the dimming value. between 0 and 100.